I'm working on this thing, and couldn't find any other build resources here or elsewhere, so thought I would start a thread here. Maybe this will be of use to someone. PCBs and panels are available from various sources. Also, if anyone knows a US source for the PJ301CM stereo jacks for this? Im interested on this project too. Where did you get the pcb? Any source for a panel? I wondered when someone would do this. 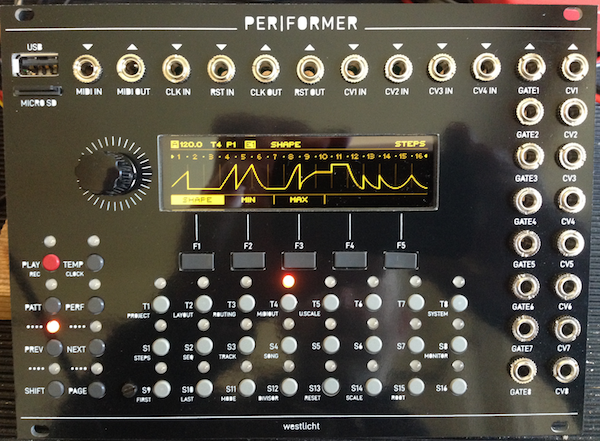 This is a great sequencer. I've been wanting something like this for a while. I just built one up, have another one to do. Building this to me was like going back to the early days of building the Mutable modules. Use the source Luke. I can see a lot of people who can't work like that having a b0rked build. And as djthopa says, it's quite an expensive BOM. The IC orientation is marked on the silk screen, though it's not obvious at first glance, or second for that matter. If you look at each device there's a white line on the silk above & below. One of the lines extends alongside an adjacent pad - either top left or bottom right. That pad is pin 1. That only became obvious to me after i opened kicad & looked at the layout If you look at the build guide, the images in that are sufficiently hi-resolution that you can detect the device markings, so if you have the same devices you might be able to use that as a double check. My advice would be to avoid using 0805 2u2 caps & use 0603. That kicad footprint is more like 0605, & theres very little free pad to get an iron on both the device & pad. An 0603 device is a much better fit, provided you ensure it's located centrally on the footprint. I can see some builders struggling to get the 0805 device fitted, making a mistake, trying to correct it & ripping up the power rail to the device it's bypassing - the MCU or DAC. The rest of the components are reasonably straightforward. Theres a few passives where the reference designator isn't adjacent to the device but they're pretty obvious which is which. The rest of my suggestions are really down to the panel components. I used a 2mm panel, as i usually would. As this uses PJ301BM's & not Thonkiconns, I'd suggest anyone else getting Alu panels fabbed to go with 1.6mm, that extra -0.4mm will help. This one is a personal thing. Some will disagree. Flame away. To avoid PCB flex, the encoder needs to be fixed to the panel, not the PCB (ie mounted flush). With the encoder in the BOM, as it has a relatively short bushing, it means the encoder will be mounted probably 5mm off the PCB. I used a split 6mm M6 nylon washer behind the encoder to keep it perpendicular to the panel. 5mm would probably be better, i didn't have one. Like this, the solder tabs on the device will just about fit in the PCB. I looks ugly, but it won't crack the PCB traces after prolonged use. I've got an image of mine if people want that posted here. (Go look back in the original Braids build for discussion on this. It got discussed at length there). The stereo PJ301 only have 4mm bushing, which means there's very little thread exposed above the panel to get a nut on (you'll see this in the images in the build guide etc). On mine i trimmed the plastic back at the base of the bushing on the socket, & mounted the jack to the panel, again, like the encoder so the device is flush to the panel & slightly raised above the PCB. Another option is to leave the nuts off on these two, but as they're the nearest bracing for the PCB at the USB socket & sd-card, they're really needed. (Stereo Thonkiconns don't have this reduced bushing size. Sigh). Again, with the extra height with the PJ301's, there isn't a lot of switch cap exposed (not helped by the 2mm panel). So when you fit the switch caps, don't push them fully home. As for loading the initial code. I'm not someone who uses pre-compiled binary, compilation is part of the module build. It took a while to get the code to build but i got it done eventually. Something i didn't see anywhere aside from in the code is the address to load the sequencer binary to. The bootloader goes to 0x8000000, as usual. The sequencer starts at 0x8010000. (The code compilation generates a standalone sequencer that you can load at 0x8000000, but then you lose the bootloader for future upgrades via the sd-card). There's only pre-compiled hex files available. If you need a binary, something like hex2bin will convert them for you. I tried this using the hex2bin i provide with dervish, & it works. djthopa if you're in the UK ping me an email, i've got a PCB, 2mm Alu panel & acrylic window going spare. It'll be at the cost to me + a donation to the designer. Anyone who's going to get panels done at PCBWay, when you add in the notes for them not to add the order number on the top silk, also ask them to put a piece of paper between each board before shipping (like PCBCart do without you having to ask them). It'll help prevent them getting scratched. The first batch of panels they sent me, the engineer decided to edit the silk text & fill in the enclosed space on the characters. They agreed to send me replacements FoC. I went for a mix of light & dark grey & one red pushbutton caps. All white would be a bit too clean looking for me. I originally planned using light grey for the function buttons, but Mouser were out of stock with those. Now it's built, i think dark works. Thanks gbiz! Lots of great info. I noticed those markings on the pcb for the chips, but it was unclear what they meant (to me at least) - I went with the detailed pics in the build guide. djthopa, I got the pcb from Michigan Synth Works, and the panel from Front Panel Express. There are other sources - I think ZZ Ardoz has them here, there might be others. You can get the gerbers from github and have your own made also. I don't really know the total BOM cost, I had a bunch of other things in my cart when I threw this stuff in there - it would have been somewhere between 100-200$US. 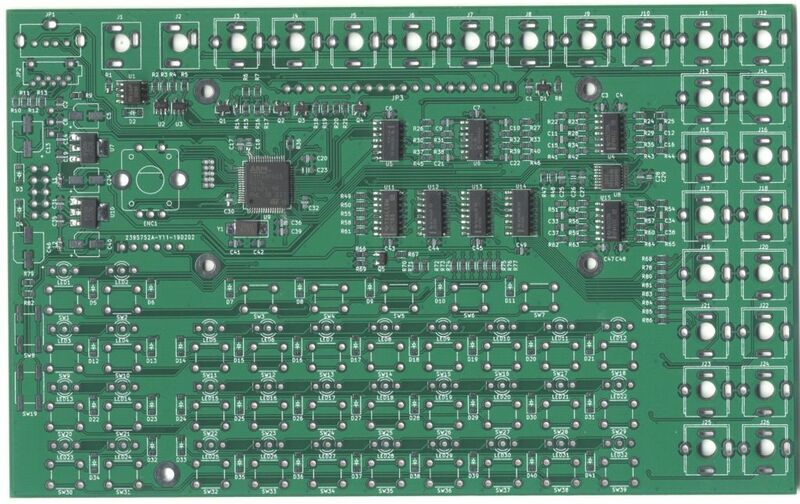 thanks for posting, this has been on my list for a while now and was going to fab some PCBs but the BOM cost put me off. i'll get to it eventually. looks like a great sequencer and the work put in by the designer is awesome. really curious about the MIDI out possibilities and using it to sequence external gear along with euro too. Hi! I just saw your reply in here. Have sent you a pm! Good call on this. I was going to do a search on mouser for 0603 2u2 caps, but decided to try one first, to see how bad it was. I managed to get them all soldered, and although it's not my favorite work, they pass beep test. I've already had some practice fitting larger parts - I used the Octopart to buy from mouser, and it didn't fill the 0603 100n caps, but I have a ton of 0805 ones, so I've been using them. From Mouser, the TDK part 810-C1608X7R1A225K looks like the best option currently. I don't envy you having to fit 25 0805 caps on 0603 footprints. ... don't think it's a big deal, if any (i don't understand op amp circuits well enough...); i soldered the caps across the resistors anyways, so the cap sits in the direct feedback path. Anyone any advice on soldering the MCU and DAC chips? I'd normally drag-solder for fine-pitch ICs, but the pads for these are very small. Anyone had success with the drag-solder method, or had success with an alternative method? On BOM leds are LTL1BEKVJNN, is there any red/yellow replacement for these on mouser? Those would be better since screen is yellow. There's a note in Simon's Build Guide about the LEDs. "Make sure to get the LEDs specified in the BOM. The circuit for driving the matrix is operating at the current sinking limits of the shift registers. 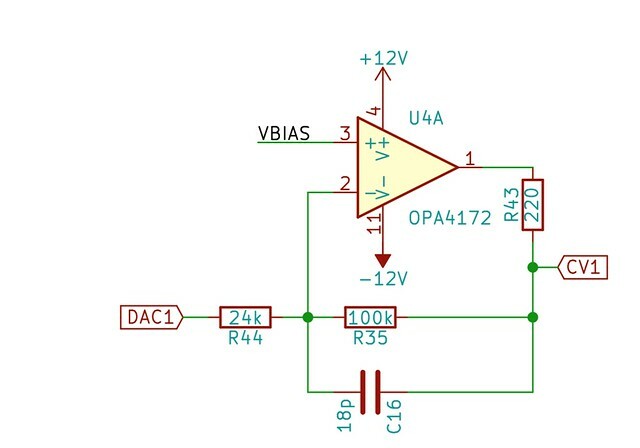 For that reason, it is important to get bright LEDs, as reducing the current limiting resistor to increase brightness will damage the shift registers!" I'd love to use red/blue LEDs, but I'm not going to risk it. Maybe these Red/Blue ones would work.. They're brighter than the specified parts. One of my 2 Performer builds will have a blue screen, so red/blue would be cool. 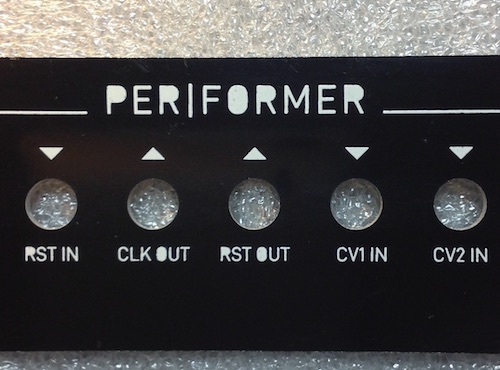 (Not in stock at DigiKey right now, but may be possible to source them from somewhere else). I drag soldered them, and had to do a bit of clean up, but everything came out ok.
i soldered the caps across the resistors anyways, so the cap sits in the direct feedback path. sounds familiar...I did that on some older rev2c ornament+crime boards to bring them up to spec. as far as positioning resistors...I find a stereo microscope gives more precision when fiddling with SMD. Also, really appreciate SMD resistor code and other SMD component markings more with the microscope as opposed to without. I had a batch of Bourns and a batch of Panasonic SMD resistors - the Bourns had markings, but Panasonic didn't. Really prefer the marked ones.